G Verma, S Sharma, I Chakrabarti. The role of arthroscopy in the management of chronic wrist pain. The Internet Journal of Orthopedic Surgery. 2007 Volume 9 Number 2. Triangular Fibrocartilage Complex (TFCC) followed by Ganglia, in 12. In 31 (53%) of patients) the preoperative diagnosis correlated with the operative findings. In 30 patients (52%) the symptoms resolved following arthroscopy. Secondary procedures were required in 18 (31%). Arthroscopy altered the management in 42 (72%) of patients. 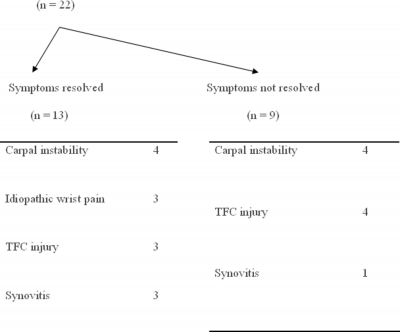 We conclude that arthroscopy of the wrist is valuable in the management of chronic wrist pain. Although chronic wrist pain is common, it can be difficult to reach a diagnosis when the physical signs are vague or equivocal. Various investigations are available; plain radiographs (with and without stress views), isotope bone scans; Computed Tomography (CT) and Magnetic Resonance Imaging (MRI) are often used. Another option is arthroscopy which has been used increasingly since its first description by Chen in 1979 (3). It is considered the gold standard as the surgeon can visualise the pathology, diagnose it and treat simultaneously. The aim of this study was to evaluate its effectiveness in the management of these problems. We performed a retrospective study of patients with symptoms of longer than three months duration (median 6 months). The study period was from 1997 to 2003. All the patients were seen, examined and operated on by the senior author. Plain radiographs were taken and, where appropriate, stress views were performed. Whenever possible, a clinical diagnosis was made and recorded in the patient's notes. No MRI scans were performed as it was not available in the district general hospital during the study period. Patients' occupations were classified according to the Office of Population, Censuses and Survey (OPCS) into Light manual worker, Clerical, Heavy manual worker and Not defined. The findings at wrist arthroscopy were compared with the presumptive diagnoses. All the arthroscopies were performed as day cases under general anaesthesia. An upper arm tourniquet was used, the radiocarpal joint filled with saline and traction applied. The radiocarpal joint was examined through the three/four portal and instruments introduced through the four/five or five/Ulnar. The midcarpal joint was examined in each case through the Midcarpal Radial portal (MCR) and instruments introduced through the Midcarpal Ulnar (MCU). Local anaesthetic (0.5% Bupivacaine) was injected at the end of procedure followed by a compression bandage (no sutures were required) which was reduced in 48hrs and a single tubigrip applied. The patients were allowed to mobilise the wrist freely. Physiotherapy was not routinely prescribed. females. The age range was 18years – 57yrs (mean = 33.68 years). The wrist arthroscopy was performed on the right side in 32 cases and on the left side in 26 cases. There were no operative complications. The operative diagnoses are summarised in Table 1.
postoperative diagnoses were the same; in 15 cases (26%) they were different. There were 12 patients (21%) in whom a pre-arthroscopy diagnosis could not be reached. In this group, arthroscopy revealed a triangular fibrocartilage complex tear in six, synovitis in three, carpal instability (one scapholunate ligament and one lunotriquetral) in two and one had a large radiocarpal cartilaginous flap. (Table 2). 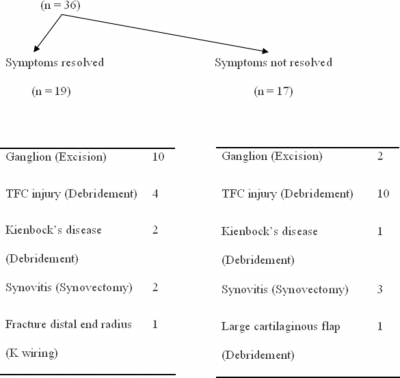 Table 2: Correlation between preoperative and postoperative diagnosis. In 36 patients, the surgery was considered therapeutic, the diagnosis having been made preoperatively. In this group 19 (53%) had relief of their symptoms while 17 (47%) did not (Table 3). 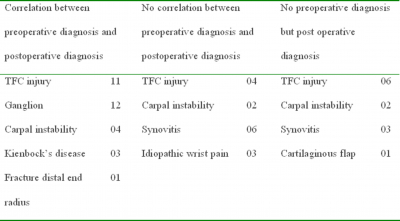 In the remaining 22 patients, the procedure was considered diagnostic even though ten of these had a “presumptive diagnosis.” Of these, seven had a TFC injury that was debrided arthroscopically (three of them obtaining pain relief) and eight had a carpal instability; half of these obtaining pain relief (Table 4). Overall, symptoms resolved in 32 cases (55%). It is of interest that two of these patients had Kienbock's disease. Arthroscopy altered the management in 72% cases (n = 42). 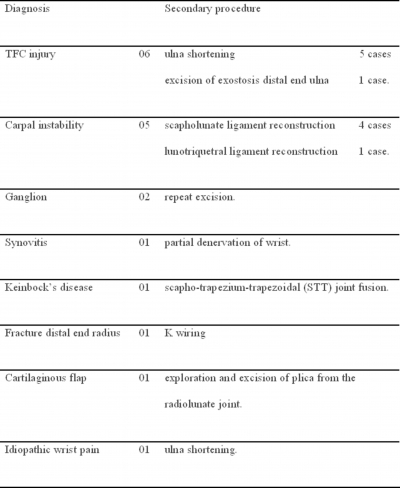 Table 5: Secondary procedures were performed in 18 cases. Wrist arthroscopy is useful in the treatment of carpal pathology (6). Some consider it more accurate than non-invasive and minimally invasive diagnostic tests such as magnetic resonance imaging and three-phase arthrography (4, 11) which require additional resources and skilled interpretation. It can also help in planning the surgical incision and deciding the best surgical alternative (4, 5). Nagle DJ et al, in their study of 84 wrist arthroscopies, found that for 23 out of 24 staging cases, arthroscopy was the only modality that yielded information detailed enough to affect clinical decision making. Arthroscopic examination allowed treatment to be individualised according to the exact degree and amount of pathology present (5). In this series of 58 patients, the pathologic arthroscopic diagnosis in 53% matched the preoperative diagnosis. In 26% of patients the lesions were incompletely diagnosed by the preoperative studies while, in the remaining 21% the preoperative diagnosis was either incorrect or unknown. Mild and moderate ligamentous injuries were assessed arthroscopically and best evaluated by midcarpal arthroscopy. The significance and cause of lesions of the triangular fibrocartilage complex (TFCC) are difficult to evaluate using standard x-ray techniques. Roth and Haddad, in a review of arthroscopy versus arthrography, found that arthroscopy added greatly to the understanding of lesions of the triangular fibrocartilage (11). Bora et al. found thatarthroscopic debridement of lesions of the TFCC was an effective treatment (2), as did Westkaemper JG in whose study (of 47 patients) 78% of those with a TFCC tear obtained good or excellent results (14). In our series, however, 14/21 did not have pain relief. This may be because ulnar variance and age were not taken into account; hence the need for ulnar shortening in five of them. If these are excluded, symptomatic relief was achieved in 7/16 overall, regardless of age and aetiology. The arthroscopic treatment of a dorsal wrist ganglion is a good alternative to open surgery. (6, 7, 10) Osterman and Raphael (10) did not report any recurrences in 18 cases; Fontes (7) had only one recurrence in 32 cases. Luchetti (9) reported only 2 recurrences out of 34 patients. In our series we achieved an 83% success rate, which is consistent with the literature (7, 8, 9, 10). Two out of 12 patients had a recurrence in the short term; it is too early to comment on the long-term recurrence rate. Ligamentous instability is a more controversial area. Arthroscopy affords an opportunity to determine the pathologic lesions and to define the extent of involvement of the articular surfaces, which may help to determine what procedure, if any, will best solve the patient's problem. It is possible (in those whose symptoms improved following arthroscopy) that joint irrigation and postoperative physiotherapy, in selected cases, were responsible for the perceived benefit. In summary, Chronic wrist pain remains a complex and difficult problem. Arthroscopy has become an integral tool in the hand surgeon's armamentarium (14). We believe it is useful in the diagnosis and treatment of wrist pain of longer than three months duration. It facilitates patient management because it allows treatment decisions to be founded on accurate and detailed information while allowing therapeutic intervention at the same time. It has definite advantages over MRI in that it provides simultaneous diagnosis and treatment in a large number of cases. 4. Cooney WP, Rochester MN. Evaluation of chronic wrist pain by arthrography, arthroscopy and arthrotomy. Journal of Hand Surgery 1993; 18-A : 815- 822. 5. Nagle DJ, Benson LS. 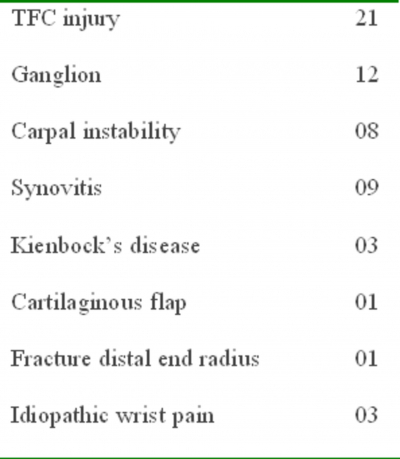 Wrist Arthroscopy: Indications and results. The Journal of Arthroscopic and related surgery 1992; 8 (2) : 198-203.